Contents: Preface.Introduction. R.D. Hare, Forty Years Aren’t Enough: Recollections, Prognostications, and Random Musings. Part I: The Evolution of the Construct. H. Hervé, Psychopathy Across the Ages: A History of the Hare Psychopath. G.T. Harris, M.E. Rice, Psychopathy Research at Oak Ridge: Skepticism Overcome. Part II: Methodological and Measurement Issues. C.S. Neumann, D.S. Kosson, R.T. Salekin, Exploratory and Confirmatory Factor Analysis of the Psychopathy Construct: Methodological and Conceptual Issues. D.M. Bolt, Analyzing the Psychopathy Checklist-Revised Using Factor Analysis and Item Response Theory. J.F. Hemphill, The Hare Psychopathy Checklist and Recidivism: Methodological Issues and Critically Evaluating Empirical Evidence. Part III: Etiology. J.P. Newman, C.A. Brinkley, A.R. Lorenz, K.D. Hiatt, D.G. MacCoon, Psychopathy as Psychopathology: Beyond the Clinical Utility of the Psychopathy Checklist-Revised. C.J. Patrick, Getting to the Heart of Psychopathy. C.M. Herba, S. Hodgins, N. Blackwood, V. Kumari, K.H. Naudts, M. Phillips, The Neurobiology of Psychopathy: A Focus on Emotion Processing. Part IV: Characteristic Behaviors and Problems. S. Porter, S. Porter, Psychopathy and Violent Crime. M.E. O’Toole, Psychopathy as a Behavior Classification System for Violent and Serial Crime Scenes. A. Spidel, G. Vincent, M.T. Huss, J. Winters, L. Thomas, D. Dutton, The Psychopathic Batterer: Subtyping Perpetrators of Domestic Violence. Part V: Generalizability of the Construct. P.J. Frick, Using the Construct of Psychopathy to Understand Antisocial and Violent Youth. A. Forth, A.S. Book, Psychopathy in Youth: A Valid Construct? R. Jackson, H. Richards, Psychopathy in Women: A Valid Construct With Clear Implications. P. Babiak, From Darkness Into the Light: Psychopathy in Industrial and Organizational Psychology. Part VI: Psychopathic Subtypes: Measurement and Implications. 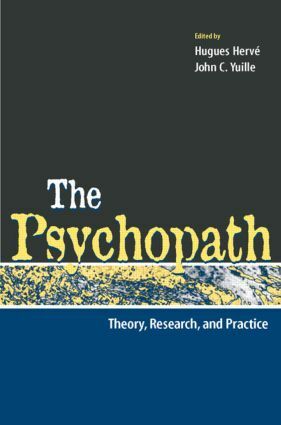 H. Hervé, Psychopathic Subtypes: Historical and Contemporary Perspectives. S.C.P. Wong, G. Burt, The Heterogeneity of Incarcerated Psychopaths: Differences in Risk, Need, Recidivism, and Management Approaches. Part VII: Practice Concerns. B.S. Cooper, J.C. Yuille, Psychopathy and Deception. D. Thornton, L. Blud, The Influence of Psychopathic Traits on Response to Treatment.